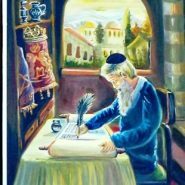 Last night, in the middle of the bedtime rush, 4-year-old Yaakov took me aside and told me: “Eema, I want to be a sofer stam [a scribe]. One of the drawbacks to having a mother who is a writer is that as soon as Yaakov completed his demands, I had to stop right then and there, in the middle of the bedtime rush, and write all this down and send it out to my entire family. Adorable! What did you answer him? Yaacov, you shana punim, you will make a great sofer! Glad he told you that you needn’t kill the cow! And your husband’s comment is right on. Glad to know my son isn’t the only one who loves Fireman Same. But he wants to be a mohel (following his father). at my son’s gan, out of 33 boys, maybe 7 have fireman sam backpacks. Thanks for sharing. Much better ambition than wanting to be Batman or other super heroes. His class must have had a discussion about safrus for him to be so informed. Nachas! Lol! Thanks for a good laugh! I think its wonderful that you stop to appreciate the adorable moments even during the bedtime rush. And that you record them for us! Shep tons of nachas :).